Keith D. Fleming, 87, of Luckey, Ohio, passed away Sunday, April 14, 2019, at the Bowling Green Manor. He was born November 9, 1931, to Dale and Vera (VanCamp) Fleming in Luckey, Ohio. 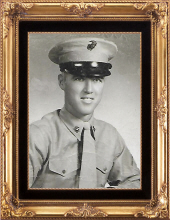 He joined the U.S. Marine Corps in 1952 having served during the Korean War. On June 5, 1952 he married Kathryn McCamey at St John’s Lutheran Church in Stony Ridge. Keith and Kathryn have celebrated nearly 67 years of marriage together. His career has spanned 30 plus years in postal service, retiring as Post Master in Monclova. In addition, he worked at various post offices which included the Lemoyne and Luckey offices. His memberships included: Grace Lutheran Church, Troy-Webster American Legion Post #240, the VFW and he was a charter member at Tanglewood Golf Course in Dowling. Grateful for having served his country, Keith always remained a proud vet of the U.S. Marine Corps. In addition to his wife Kathryn, Keith is survived by a cousin, numerous nieces and nephews and close friends, Jeff and Cheryl Simpson of Luckey. He was preceded in death by his parents, and half-sister: Valda Welling. Keith will be laid to rest in a family committal service in the Troy Township Cemetery, Luckey, Ohio. Marsh & Marsteller Funeral Home is handling the arrangements. The family asks that in lieu of flowers, memorials take the form of contributions to: Hospice of Northwest Ohio. Condolences may be shared with for the family at www.marshfuneralhomes.com. To send flowers or a remembrance gift to the family of Keith D. Fleming, please visit our Tribute Store. "Email Address" would like to share the life celebration of Keith D. Fleming. Click on the "link" to go to share a favorite memory or leave a condolence message for the family.